I have always wanted to create an environment that captures the beauty of life... The setting I wanted to create from using wonderful fragrances to evoke that special feeling... The unveiling of my signature home fragrance collection is another dream come true. 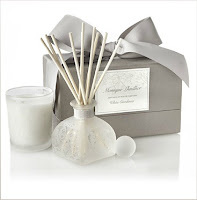 The Monique Lhuillier Home Fragrance collection will be available at Helen Rodrigues.